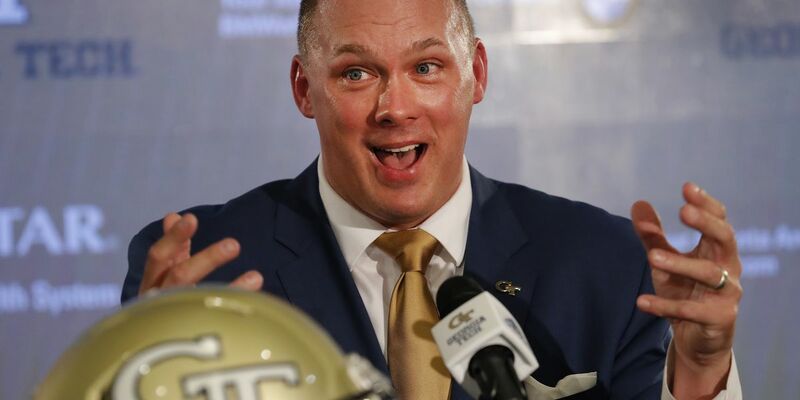 ATLANTA (AP) — Georgia native Geoff Collins said Friday he landed his dream job when hired to return as Georgia Tech's coach. Most notable among changes the former Temple coach will bring to the Yellow Jackets will be a shift from the spread-option offense used by former coach Paul Johnson the last 11 years. At his introductory news conference after his hiring was announced early Friday, Collins said he will install "NFL-based" schemes on offense and defense. Those changes will be a challenge for players recruited by Johnson for the run-first attack with its triple-option plays. Collins said he began recruiting immediately to prepare for the early signing period that begins on Dec. 19. There will be some key needs, possibly including at quarterback, to jump-start the transition to a pro-style offense. "I've already been watching tape on the plane," Collins said, adding "Recruiting matters. That is a huge priority for us." The 47-year-old Collin, is a former Florida and Mississippi State defensive coordinator and Georgia Tech assistant who was 15-10 in two seasons at Temple. Before his time at Florida (2015-16) and Mississippi State (2011-14), Collins was a graduate assistant and tight ends coach at Georgia Tech under coach George O'Leary from 1999-2001. He returned to serve as recruiting coordinator at Tech under coach Chan Gailey in 2006. A native of Conyers, Georgia, Collins said he began dreaming about eventually becoming Georgia Tech's coach during his two stints as an assistant. He said the opportunity, which developed quickly when Johnson stepped down on Nov. 28, was not expected. "I formed a vision in my head in multiple stops I've been here of what this place can be, what this place should be," he said. He spoke of emphasizing the Georgia Tech brand and culture. "Recruits choose brands and our brand should be as strong as anywhere in the country and it's going to be," Collins said. He said he would take advantage of the school's tough academic requirements as a selling point in recruiting "to come to a place where education matters." "While it is always difficult to lose a head coach, it is a testament to what we have built at Temple through our students, our fans, our alumni and our donors that we can continue to have success," Kraft said in a statement released by the school. "We have a world-class university, strong support staff, excellent facilities, passionate supporters and a very healthy culture and I am confident that there will be great interest in our job yet again." Collins had an 8-4 record with a 7-1 mark in the American Athletic Conference this season. He said his farewell meeting with his Temple players on Friday was "heart-wrenching." Collins took over for his close friend Matt Rhule last year, when Rhule left for Baylor. Foley also was interim coach for the Military Bowl in 2016 following Rhule's departure. Foley will become the first coach in Temple history to coach two bowl games. Collins said he is looking forward to being a "spectator" for Georgia Tech's bowl game. Johnson will coach the team against Minnesota in the Quick Lane Bowl in Detroit on Dec. 26. Collins met with Georgia Tech athletic director Todd Stansbury in New York earlier this week and with the university president G.P. "Bud" Peterson in Atlanta on Thursday. An agreement was reached on the deal, expected to be for seven years, late Thursday. Stansbury said Collins fit every requirement he sought in a coach, including "somebody who would embrace Georgia Tech and would look at the challenge and the uniqueness of Georgia Tech and that would actually be part of the lure." Collins' flight from Philadelphia on Friday was delayed by weather and problems with his private plane, pushing back the scheduled time for the news conference two hours. "One of those planes Snoopy used to fly had a flat tire right on the runway," he said, adding a strong headwind then slowed the flight after the tire was repaired. Collins said he was impatient at first. "Then I sat back and realized you've been waiting 22 years for this, been waiting to be the coach at Georgia Tech for so long, if you have to wait a little bit it's OK," he said.